(CNN)–A house is painted in rainbow colors to counteract Westboro Baptist Church neighbors. CNN's Jeanne Moos reports. (CNN)– Rock stars the Foo Fighters played an impromptu show for a group of protesters from Westboro Baptist Church who had come to protest outside the band's show Friday night in Kansas City, Missouri. Band members jumped onto a flatbed truck, sporting costumes they wore in a recent video parody, parked across the street from the protest, and sang "Hot Buns," CNN affiliate KSHB reported. The lyrics to the song: "Driving all night, got a hankering for something/Think I'm in the mood for some hot-man muffins/Mmmm, sounds so fine, yes indeed" made pointed response to the church's protest. As they often do, the protesters held up brightly colored signs that read, "God Hates Fags," and "Thank God for Dead Soldiers." Westboro Baptist Church, known for controversial protesting, demonstrates outside the U.S. Supreme Court in March. Washington (CNN) - A law enforcement official confirms members of the Westboro Baptist Church, known for its controversial practice of picketing military funerals, participated in training for law enforcement officials at Quantico Marine Base in Virginia. The sessions were discontinued this spring after Tom Browne, assistant director for the FBI, voiced strong opposition to bringing the group to a military facility. Members of Westboro were "respectful" when they were on the base and did not cause any disruption, according to the official. He adds, "It wasn't the purpose to give them another outlet to vent their views. It was more academic." The story about staff training sessions between the FBI and Westboro Baptist Church members was first reported by NPR News on Wednesday. Westboro Baptist Church leader Fred Phelps says God is punishing the United States for "the sin of homosexuality." (CNN)–When Westboro Baptist Church protesters roll into any given town, most places don't exactly put out the welcome mat, until this Sunday. "This False Prophet and His Blind Lemmings Welcome You to Our Whore House for God's Grace and Free Donuts," Pastor Mark Driscoll of Mars Hill Church in Seattle announced on his blog this week after learning that Westboro plans to picket one of his churches on Father's Day. Driscoll is a popular pastor in the Pacific Northwest. He heads a group of multisite churches that regularly draw 10,000 parishioners a week across 10 locations. He preaches live at one location, and his sermons are sent out by video to the other locations the following week, when the services are held with live music and another onsite pastor. Driscoll, a popular author and speaker, is "Christian-famous," which appears to have led to the protest. Driscoll found out about it when someone posted a link on his Facebook wall. Washington (CNN) - Protesting members of the controversial Westboro Baptist Church were met with an unlikely group of counterprotesters Monday at Arlington Cemetery. Hours before President Barack Obama led the nation's Memorial Day observances at the Tomb of the Unknowns, three members of the Westboro Baptist Church were challenged by others who disagreed with them - including members claiming to be from the Ku Klux Klan. Editor's note: Jane Velez-Mitchell hosts "ISSUES with Jane Velez-Mitchell," a topical event-driven show with a wide range of viewpoints that airs every night at 7 ET on HLN. What does homophobia look like when it's stripped bare of fancy costumes like family values and tradition? It looks like that group of strange, angry people who protest at the funerals of U.S. soldiers who've died fighting for our country. The group's hypothesis is that God is punishing America for its acceptance of homosexuality. Many of us wonder, to borrow a phrase from Jerry Seinfeld, who are these people? Recently, on my HLN show, I got some insight during an interview with Nate Phelps. He's the estranged son of Pastor Fred Phelps, the leader of the infamous Westboro Baptist Church, which organizes those anti-gay protests. (CNN) - An estranged son of anti-gay Kansas pastor Fred Phelps said Wednesday that the spiritual leader of Westboro Baptist Church hit his wife and beat his children with a mattock handle until they bled. Nate Phelps is the seventh of the Westboro Baptist minister's 13 children. The younger Phelps severed ties with his family on his 18th birthday and said he hasn't had contact with his father in three decades. Nate Phelps is currently writing a book about his family. The U.S. Supreme Court ruled earlier this month that Westboro's practice of picketing the funerals of fallen soldiers with offensive placards is constitutionally protected free speech. The picketing, which includes chants and placards stating "God Hates Fags" and "Thank God for Dead Soldiers," have enraged supporters of the U.S. military and the families and friends of slain soldiers. Nate Phelps called his pastor father "one of the best reasons that America has been forced to get off the fence and address this issue (of gay rights)." Read the full story about the estranged of Westboro Baptist Church. Editor's note: Jeffrey Toobin is a senior legal analyst for CNN and a staff writer at The New Yorker magazine, where he covers legal affairs. 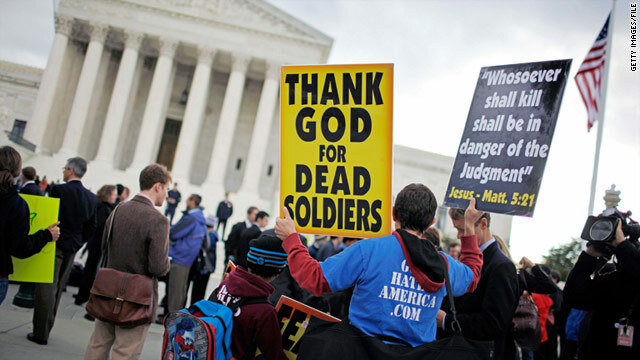 (CNN) - The Supreme Court ruled that a Kansas church whose members travel the country to protest at military funerals, holding signs that say "Thank God for dead soldiers" and "God blew up the troops," has a right to continue such demonstrations. The case was brought by Albert Snyder, whose 20-year-old son, Marine Lance Cpl. Matthew Snyder, was killed in Iraq in 2006. 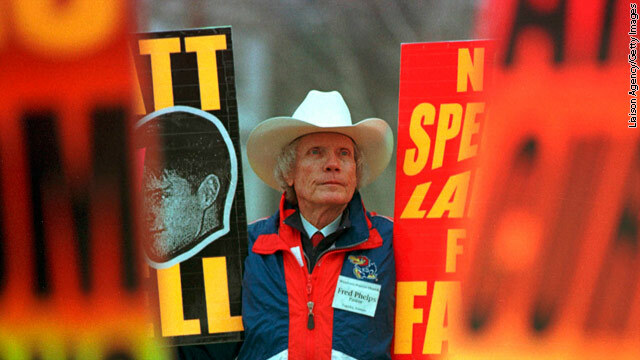 The family-dominated Westboro Baptist Church, run by Fred Phelps, protested at Matthew Snyder's funeral to spread their opinion that American deaths in Afghanistan and Iraq are God's punishment for U.S. immorality and tolerance of homosexuality and abortion. CNN.com talked to CNN senior legal analyst Jeffrey Toobin about Snyder v. Phelps, which pitted the right of families to grieve in privacy against the First Amendment right to free expression.